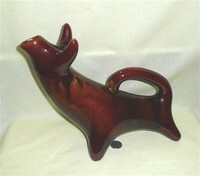 My Webster’s third International Dictionary defines rhyton as “an ancient Greek drinking horn of pottery, usu. having the base in the form of the head of an animal, woman, or mythological creature.” Wikipedia is much more expansive, stating “A rhyton (plural rhytons or, following the Greek plural, rhyta) is a container from which fluids were intended to be drunk or to be poured in some ceremony such as libation. The English word rhyton originates in the ancient Greek word ῥυτόν (rhy̆tón or rhŭtón). The conical rhyton form has been known in the Aegean region since the Bronze Age, or the 2nd millennium BC. However, it was by no means confined to that region. Similar in form to, and perhaps originating from, the drinking horn, it has been widespread over Eurasia since prehistoric times. (note: I saw some great Parthian examples in a museum in Ashkabad, Turkmenistan) … Many vessels considered rhytons featured a wide mouth at the top and a hole through a conical constriction at the bottom from which the fluid ran. 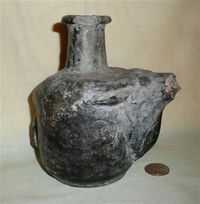 The idea is that one scooped wine or water from a storage vessel or similar source, held it up, unstoppered the hole with one's thumb, and let the fluid run into the mouth (or onto the ground in libation)… Rhyta were often used for liquids that needed straining, such as wine, beer and oil. Some rhyta were used in blood rituals and animal sacrifice. In these cases, the blood may have been thinned with wine. 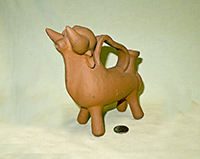 Some vessels were modeled after the animal they were intended to be used with during ritual, but this was not always the case… Rhyta occur among the remains of civilizations speaking different languages and language groups in and around the Near and Middle East, such as Persia, from the second millennium BC. They are often shaped like animals' heads or horns and can be very ornate and compounded with precious metals and stones.” The Google ‘Images of Rhyton’ page has some 181,000 pictures, and while the majority are of the horn-shaped form, there are also many that feature a full-bodied caracature of a cow, bull, or other creature, molded much like the ‘modern’ cow creamer or pitcher. Indeed, some of those pictures are of works from modern artists’ (including William Morris). This section of my collection does not include any of the ancient (BCE) rhytons like those shown on the History page. – those are either in museums or extremely expensive. It does however have a couple that are representative of the early ones plus a few that appear to be copies of ancient ones, as well as modern vessels that are designed for uses similar to those for which rhytons were intended. 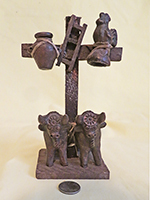 Thus here I include the Peruvian Toritos de Pucara, which originally were used to hold chicha and blood for the cattle branding ceremony as described on the Places page. 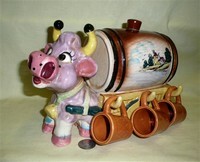 Probably inappropriately, I have also put here a number of Spanish bull caricature vessels designed for wine or oil and vinegar (popular tourist items), as well as other cow or bull caricatures that might best be termed ‘cruets’ but which have shapes somewhat reminiscent of some of the early rhytons. And, I’ve snuck in a couple liquor dispensers and what I believe to be an old Chinese soy pot, for lack of a better place. More appropriately, I have added a section at the bottom of this page for my Hindu Nandi – designed for libations of holy water in Hindu Temples devoted to Shiva – since they, and the somewhat similar cow-headed vessels used to hold ghee to feed the holy flame, have ritualistic purposes. Well, this was sold as a rhyton, and although it has no holes it does seem to be a cute little bull effigy. It was said to be Amlash, 1st millennium BC, and came certified as original from an antiquities dealer in Cyprus. It was sufficiently inexpensive as these things go that I thought it would make a good introductory contribution to this part of the collection. Amlash is a fairly generic term referring to a geographic region in northern Iran, and apparently most of the artifacts from there date to the 9th-8th century BCE. A check of the photos on google shows that hump backed bulls seemed to be popular items for Amlash rhytons. 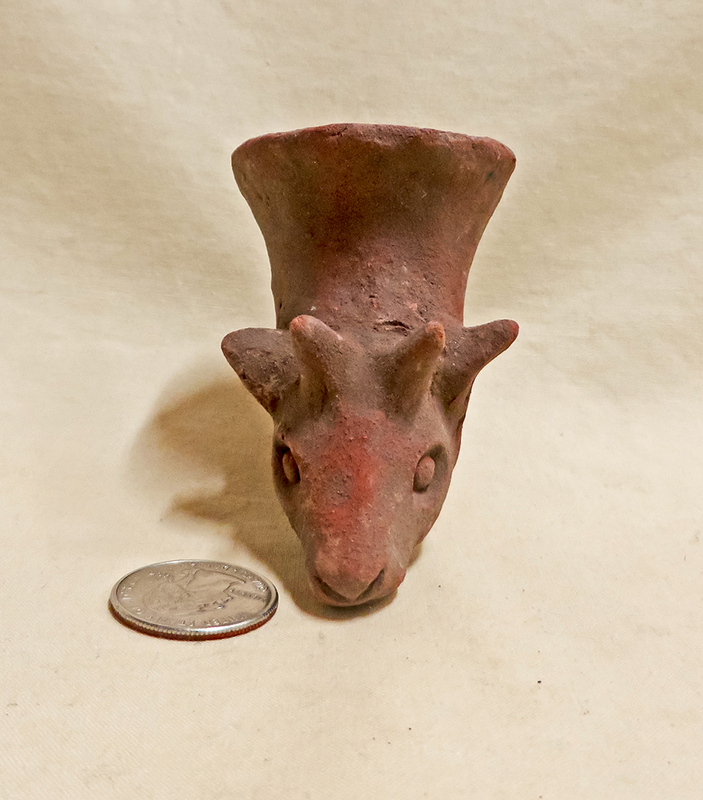 The UK seller from whom I purchased this little vessel on ebay stated in his description that it is a Viking terracotta rhyton dating from around 250-350 AD, and came from a private 1970s collection of Eastern European items. It's too small to be useful for drinking (except perhaps for a very tiny Viking) and is unglazed so not really suitable for liquids meant to be consumed. He also stated that it's unusual in that it bears a fertility symbol, so possibly it had some ritualistic use. But then, he also said exactly the same think about a similar gost's head piece, so I am beginning to doubt all the above. 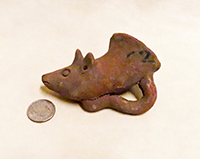 At any rate it's the closest to an affordable item I have yet found that is ostensibly from that period that sure looks like a rhyton...and it's really quite interesting in its own right, if fairly crude. I hope to learn more. This is a small replica of a Minoan Bull’s Head Rhyton from Crete. 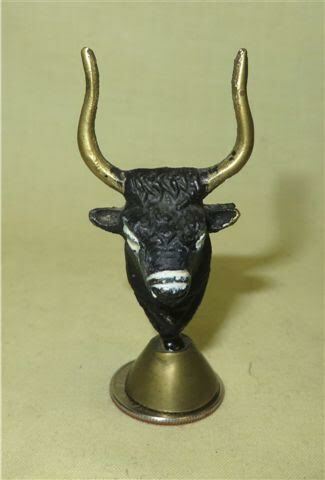 From the number of postcards and replicas of it and very similar bulls’ heads available on eBay it seems to be a popular museum piece. This is my one and only cow or bull headed reasonably sized drinking horn – not Greek, not large, indeed Chinese ceramic painted to resemble cloisonne - but nevertheless this seemed a reasonable place to put it. 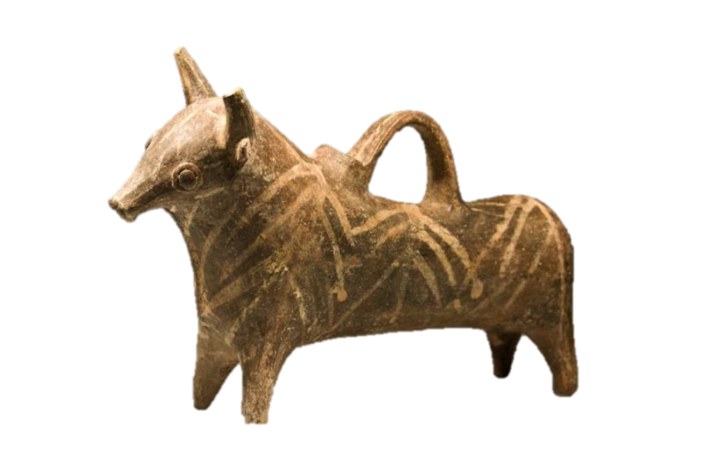 My modern red-clay jug with the grey glaze and stylized markings bears a close family resemblance to this Cypriot rhyton whose picture I downloaded from google’s rhyton images. The seller said she’d like to think that it was Cretan or Etruscan, and it turns out she was pretty close. 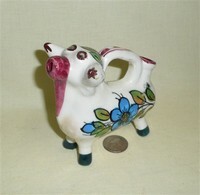 Both of these stylized bulls came to me from the UK. With their large swept back horns and conjoined legs as well as the symbols on the sides they’re clearly intended to be reproductions or at least representations of some earlier ritualistic vessel. 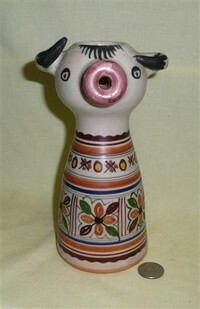 This is a Peruvian Torito de Pucara. Rhyton ‘purists’ would probably object because there is no Greek heritage here, but rather a combination of Spanish and indigenous Andean. 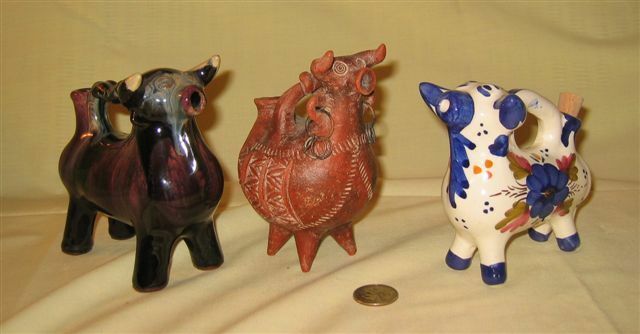 However as noted in other places where I have displayed these lovely bull vessels, they were initially designed for rituals associated with the cattle-branding ceremony, to hold a mixture of blood and chicha (corn-based beer). Thus they certainly meet the basic (expanded) definition. They have become a very popular souvenir of Peru, and also are often found in pairs on newly-completed roofs of houses, bearing a bottle each of chicha and holy water. Here are two more Toritos, both acquired from Novica which sells products from artisans around the world to folks like me. 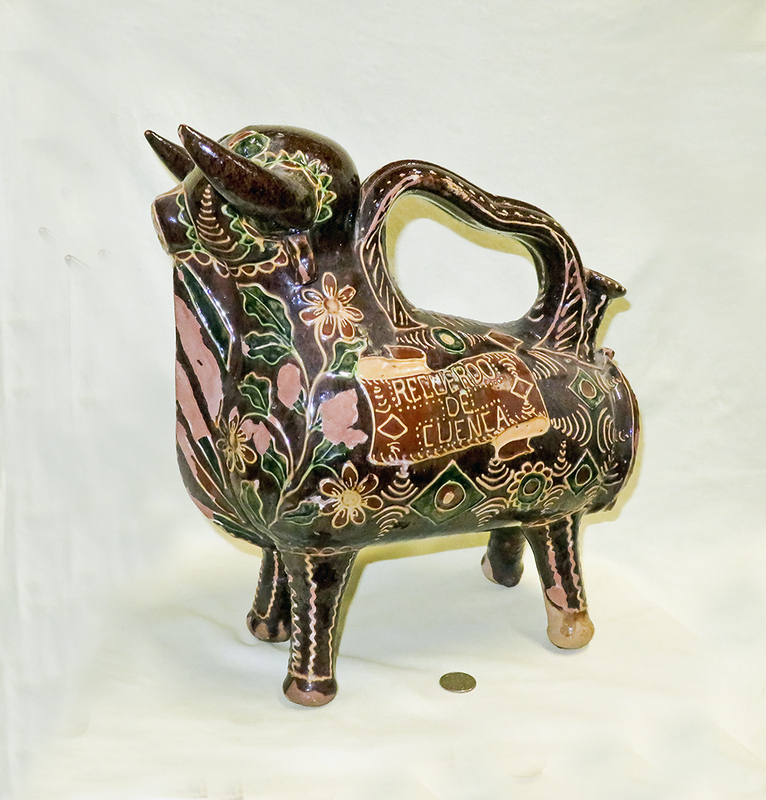 The large greyish ons is by Walter Jose Acosta, from the Huambo province in the Amazon region of Peru, who is dedicated to perpetuating the beauty of Peruvian ceramic art. The little black one is by Maribel Posso Olivares who with a friend now heads a workshop with about 12 artisans, creating ‘alasitas’ which are tiny items reflecting wishes. Novics states that its mission is to spread happiness to both the artisans and to their customers, and their items come beautifully (and safely) wrapped, and in the case of these two, with little dolls attached to the red bows. 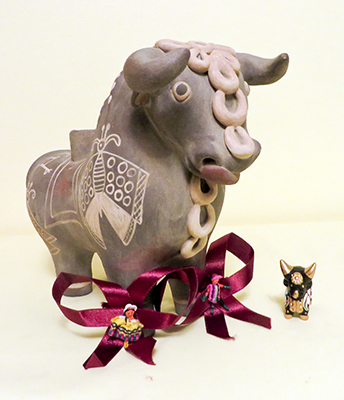 Two more from Peru – the one on the right is a version of the Torito, and the other a quite different stylized version of a bull. Its tongue very nearly covers the hole in its nose. When my wife and I visited Peru we encountered a very large number of marvelous old pottery figures, some quite scatological and all fanciful, in the museums. As noted above, bulls were not native to the area so this type of figure appears only after the Spanish conquest. 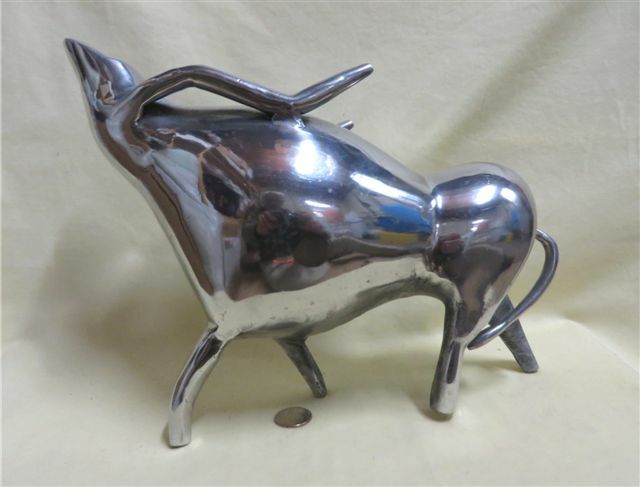 Both of these large stylized bulls have just a single hole in the snout, and bear a interesting resemblance to some of the ones I found on the google rhyton images page. They’re clearly not made for cream or milk – but would serve well for wine (or blood). The red glazed ceramic one came to me from Ontario Canada and the only information the seller could provide is that he got it at an estate sale from someone who had an extensive pottery collection, and that it’s most likely Blue Mountain or CCC pottery. Here starts a series of cow shaped containers that likely have no ritualistic purpose, but don't really fit in other spots. 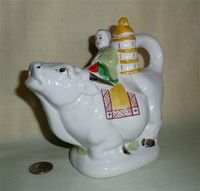 We start with a pair of Spanish cruets from Seville, presumably designed for oil and vinegar (and for sale to tourists). The large one is intended, I believe, for wine. 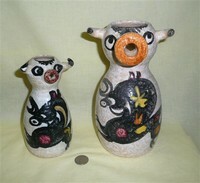 On the left are two wine pitchers wine pitchers decorated with an impressionistic bull. They're meant to be mother and child I guess since only a Mom could love a face like that. 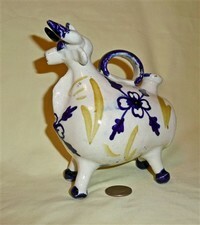 Sharing this section is a similarly shaped vessel from Mexico. 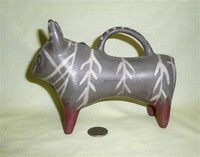 This is a traditional clay piece from Cuenca, Spain. 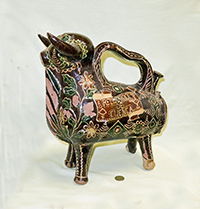 From what I can glean from a number of web sites and a knowledgeable UK seller, it is an example of Cuenca’s most typical pottery item, the so called "Toro Ibérico" (Iberian Bull) which was originally created by the master potter Pedro Mercedes who was inspired by an Iberian bull head from the 7c Moorish period which was found in the town of Huete and is kept in the Museo de Cuenca. 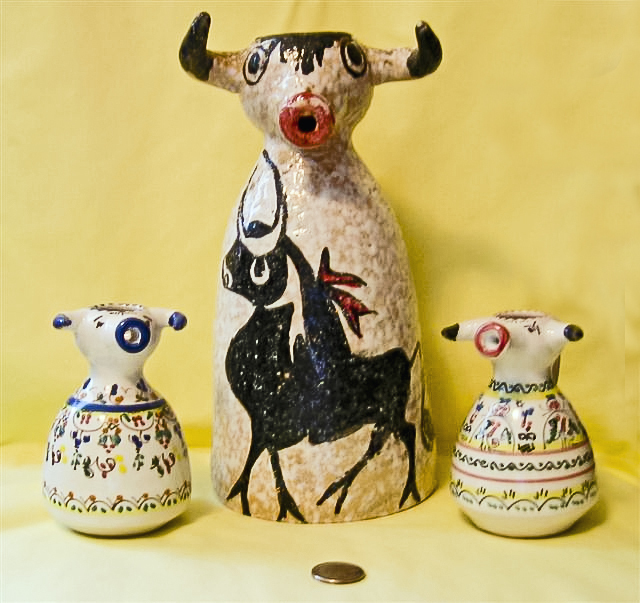 Apparently the modern ones became favored as family gifts representing the spirit and courage of the Spanish or Iberian bull, a reputation gained from bullfights. 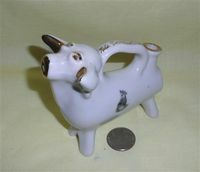 These cute little bulls proved to be very popular and have morphed into souvenirs, as well as into vessels used - like those above - for oil and vinegar or perhaps wine. Here are a couple of the souvenir versions - much more gaudy than the traditional clay form. They both have raised letters that read “Recuerdo de Cuenca” , Souvenir of Cuenca. The smaller one also has an impressed seal on its right rump that reads “E. del Castillo Alfarero , Cuenca” and Emilio Castillo’s ceramic studio is indeed in Cuenca Spain. Some potters - and some tourists - apparetly got carried away. This 'Recuerdo' is downright huge and heavy. Here’s another of the same shape, this time with cats on the side, advertising a holiday resort in Torremolinos, Costa del Sol, Spain. It was made in Spain and is marked with a red crown over a cup with a V, over a blue wreath with “Valdelvira” at the bottom. The popularity of the Toro Iberico has clearly spread well past Cuenca. 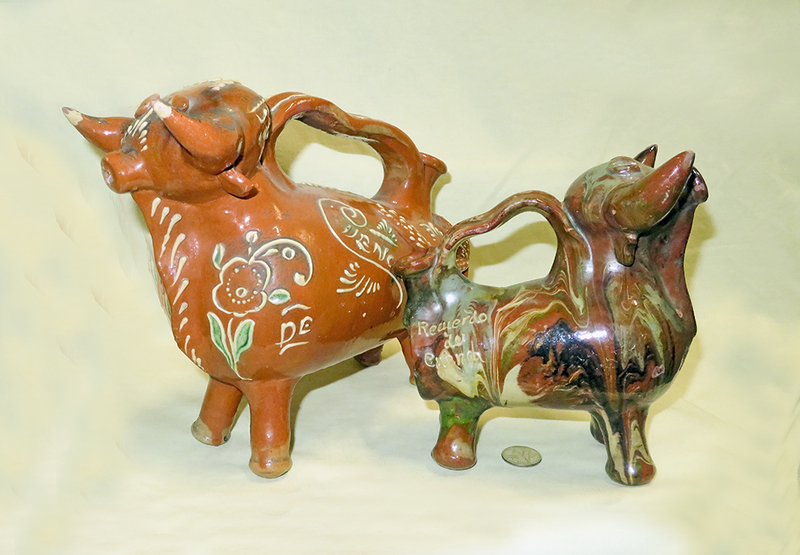 These small versions - some typical Iberain bull in form and others considerably more fanciful - are likely intended to hold olive oil or something similar - but they probably have a right to be on this page given that their shape is quite reminiscent of some of early ritualistic vessels. Then again, for those on a Mediterranean diet, use of olive oil can indeed be considered a rirual. The first one of these that my wife and I got was the reddish brown clay one with the earrings in the middle of the upper picture. We pourchased it in a shop in San Gimignano, Italy, in 1990. It carries fond memories of a pleasant vacation in central Italy, and a fascinating old town of nine towers. Great wine in the area, too! The only other one of these that’s marked is the dark brown one on the far left of the upper picture: from Enesco, and made in Japan. Perhaps it should be called a "Toro Nipponico". 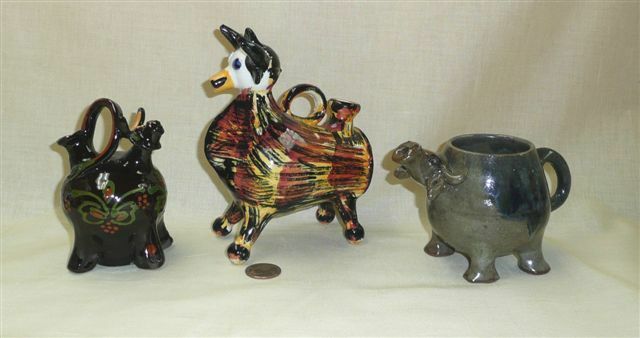 The little grey-blue cup with cow head spout on the far right in the lower picture is hand made, and almost certainly comes from somewhere in the US; the eBay seller was in Arizona. I conclude that the traditional Curnca Bull has indeed become world-reknowned. This interesting Russian liquor dispenser came, thanks to eBay, from a seller in Vratsa, Bulgaria. 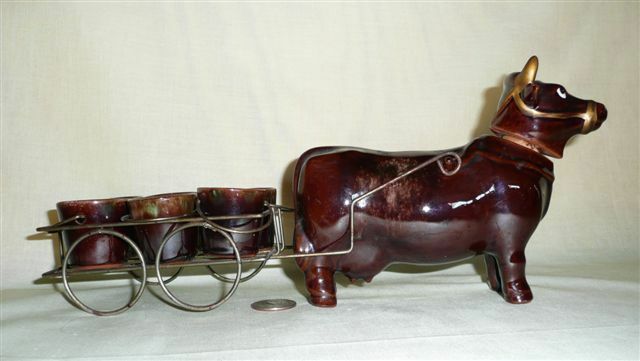 This bull pulling the little wagon with cups is a liquor decanter – its head comes off for pouring. Here is another version of a liquor dispenser. There are some very lovely French ones on the Faience page, but this one is quite obviously Japanese (and it has a sticker that says so), labeled for “PAC” although it has all the characteristics of several other cows scattered throughout that came from Thames. Somehow I can’t imagine it holding sake. Indeed, I doubt that one like this was ever sold in Japan – only some crazy American would ever buy something this weird. This is an old Chinese earthenware pot with the head of a bull or water buffalo that the seller claimed is 17c Qing Dynasty; it’s beaten up enough to be so, although it’s now against the law to export items from China that date from before 1911. It was most likely designed to hold water or, even more likely, soy sauce. As I understand it (I get confused by Hindu deities), Nandi the white bull is Shiva’s vahana or vehicle, the mount on which he rides. A note from the Philadelphia Museum of Art adds that “Shiva is a great ascetic whose power emerges as contained sexual energy. Appropriately, he is accompanied by the virile bull. An image of Nandi sits in the hall or porch of temples dedicated to Shiva, facing into the sanctum like the primary devotee that it is.” In ancient India, he was also an independent deity known as Nandikeshvara, the Lord of Joy, represented as a man with a bull’s head. 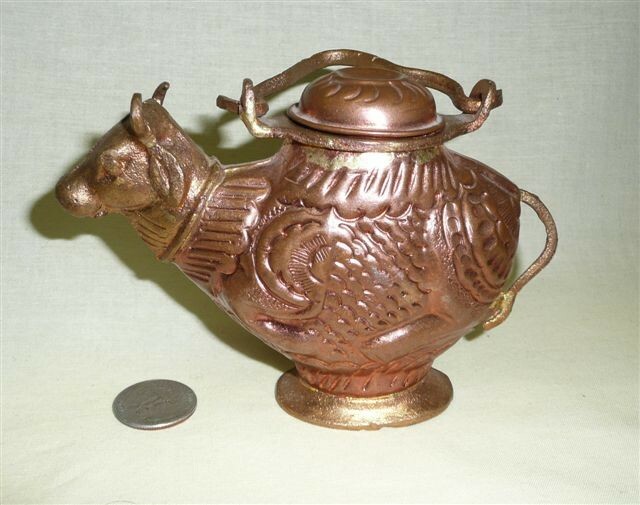 The folks who sold me this lovely older copper version – which comes from Jodhpur in Rajasthan – said that these pots are used by priests to spray holy water on the devotees who come to worship at Shiva’s shrine, or are carried by holy men to hold and disperse holy water from the Ganges. 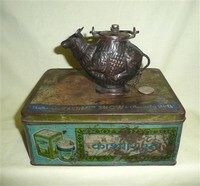 As you will note, this Nandi arrived very carefully packaged for safety in an old tin for Kashmir Snow Beauty Aids. Here are two modern brass Nandi, both coming direct from India but without the fancy box. 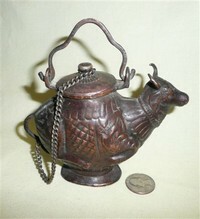 Here are two small nandi water pots. The one on the left with nicely inscribed marks was said to be from Natal, but was shipped from Singapore. 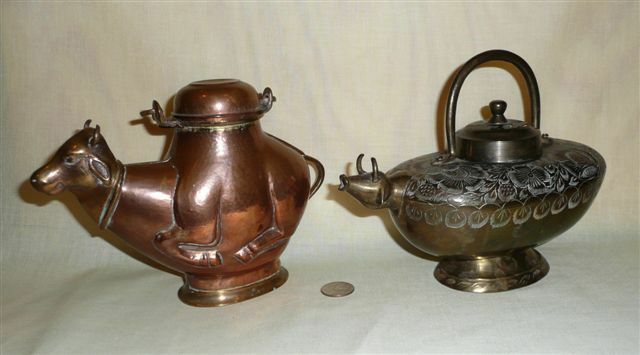 The copper one on the right is from India; it was very dirty and tarnished when it arrived so I cleaned it up a bit. Here are three more Nandi water pots in different configurations and types of metal, as well as what I found out later were vessels for ghee, as explained in the next section. 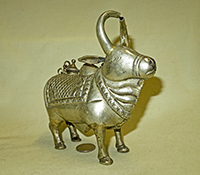 Straight from Ahmendabad in Gujarat, India comes this lovely brass (so said the seller) standing nandi. Very different in shape and structure from all my others, it is nonetheless designed for holding and dispensing holy water…not through the mouth which has no hole, but rather through the hollow horns. I don’t know if this has any ritual significance, but from my perspective it certainly qualifies for the collection. Finally, here are three open-topped Nandis – the largest and smallest came from Sunil Arts & Engg Works in Jodhpur, Rajasthan, India, and the silver colored one from a seller in the US who presumably brought it back as a souvenir. The well crafted tiny copper Nandi was said to be 70-80 years old, and used in temples. 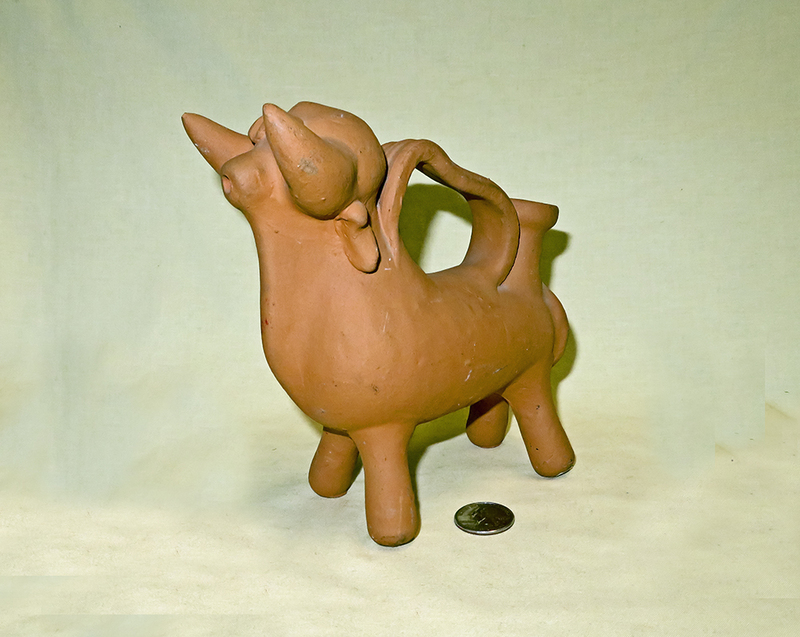 The largest one, with a stand under its chin and with internal ridges, was sold to me as a pot or ‘ash tray’ (which I doubt), but I have also seen an identical one described on eBay as a Kharal, which is essentially a mortar for grinding opium and making ‘opium water’ which is then taken through the bull’s mouth. Perhaps some kind Hindu can enlighten me – I can only say that I’m learning, slowly, that holy cows and bulls from India can have many manifestations and uses.